It’s a very good time to be a bingo affiliate. The enormous resurgence of interest in this classic game has a new generation of fans. Even the stalwart faithful of traditional landbased bingo halls are migrating online. However, with great popularity comes great responsibility for affiliates to offer a safe and friendly online experience. The lifetime value of a player increases dramatically if you can keep them coming back. 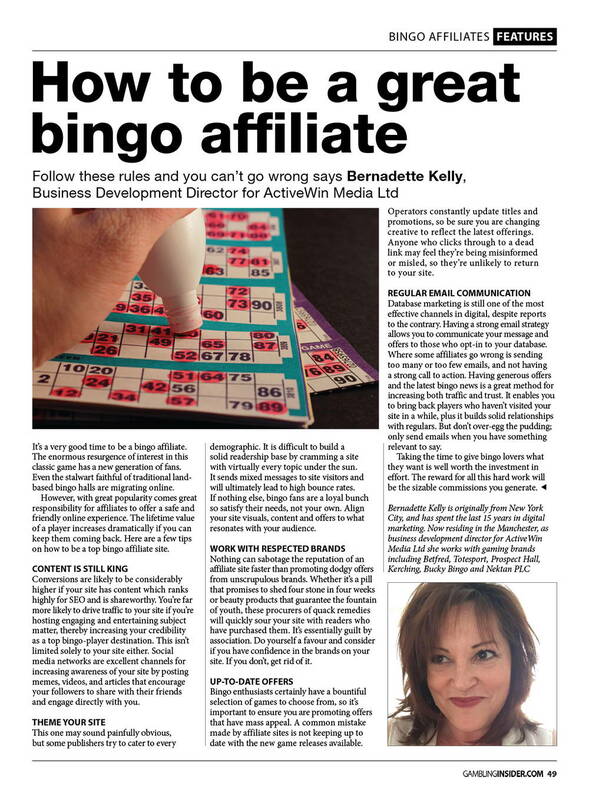 Here are a few tips on how to be a top bingo affiliate site. Conversions are likely to be considerably higher if your site has content which ranks highly for SEO and is shareworthy. You’re far more likely to drive traffic to your site if you’re hosting engaging and entertaining subject matter, thereby increasing your credibility as a top bingo-player destination. This isn’t limited solely to your site either. Social media networks are excellent channels for increasing awareness of your site by posting memes, videos, and articles that encourage your followers to share with their friends and engage directly with you. This one may sound painfully obvious, but some publishers try to cater to every demographic. It is difficult to build a solid readership base by cramming a site with virtually every topic under the sun. It sends mixed messages to site visitors and will ultimately lead to high bounce rates. If nothing else, bingo fans are a loyal bunch so satisfy their needs, not your own. Align your site visuals, content and offers to what resonates with your audience. Nothing can sabotage the reputation of an affiliate site faster than promoting dodgy offers from unscrupulous brands. Whether it’s a pill that promises to shed four stone in four weeks or beauty products that guarantee the fountain of youth, these procurers of quack remedies will quickly sour your site with readers who have purchased them. It’s essentially guilt by association. Do yourself a favour and consider if you have confidence in the brands on your site. If you don’t, get rid of it. Bingo enthusiasts certainly have a bountiful selection of games to choose from, so it’s important to ensure you are promoting offers that have mass appeal. A common mistake made by affiliate sites is not keeping up to date with the new game releases available. Operators constantly update titles and promotions, so be sure you are changing creative to reflect the latest offerings. Anyone who clicks through to a dead link may feel they’re being misinformed or misled, so they’re unlikely to return to your site. Database marketing is still one of the most effective channels in digital, despite reports to the contrary. Having a strong email strategy allows you to communicate your message and offers to those who opt-in to your database. Where some affiliates go wrong is sending too many or too few emails, and not having a strong call to action. Having generous offers and the latest bingo news is a great method for increasing both traffic and trust. It enables you to bring back players who haven’t visited your site in a while, plus it builds solid relationships with regulars. But don’t over-egg the pudding; only send emails when you have something relevant to say. Taking the time to give bingo lovers what they want is well worth the investment in effort. The reward for all this hard work will be the sizable commissions you generate.